Learn to determine the volume of a rectangular figures, called prisms, by the cube-stacking method to ace exams. 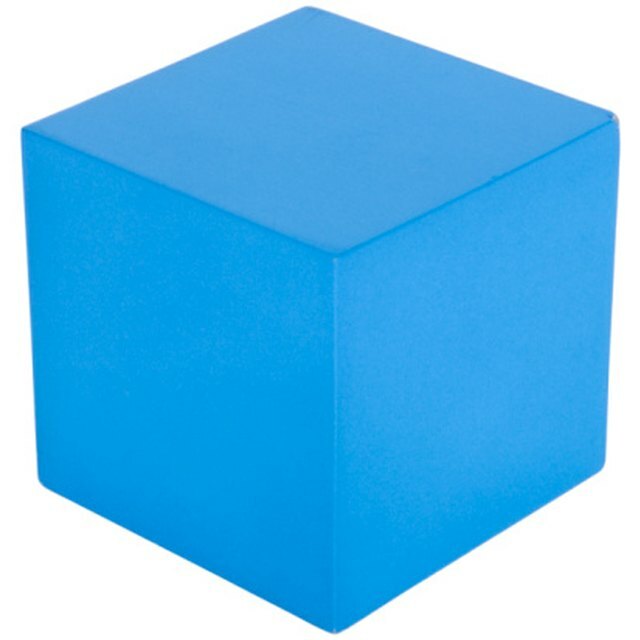 The cube-stacking method is an elementary tool to learn to find volume. The idea is that "unit" cubes are shown filling a portion of a particular prism. A unit cube measures a distance of one on each side. The cube are then counted in a way to allow calculation of the volume visually. Count the number of unit cubes along the length and width of the base of the prism. For example, there might be 10 cubes along the base's length and 5 along its width. This makes a base of 10 rows of cubes with 5 cubes in each row. Multiply the length by the width to obtain the area of the base of the prism in square units. Continuing the example, you have 10 times 5, or an area of 50 square units. Count the number of cubes along the height of the prism. For example, there might be 15 cubes from the prism's top to bottom. Multiply the area by the height to arrive at the volume of the prism in cubic units. Completing the example, you have 50 square units multiplied by 15 units, or a volume of 750 cubic units. Hirsch, William. "How to Find the Volume of Cube Stacking." Sciencing, https://sciencing.com/volume-cube-stacking-8488851.html. 24 April 2017.